Yesterday I told you about my respect for my grandfathers and their gardens. I also announced that I would prepare all my meals this week with the vegetables that they gave me this weekend. Yesterday, it was a cold, windy and rainy day. Clearly, the autumn arrived in Belgium. These weather conditions ask for a hot and healthy meal. So with the pumpkin, tomatoes, potatoes and onions of my grandfathers I made a delicious soup. 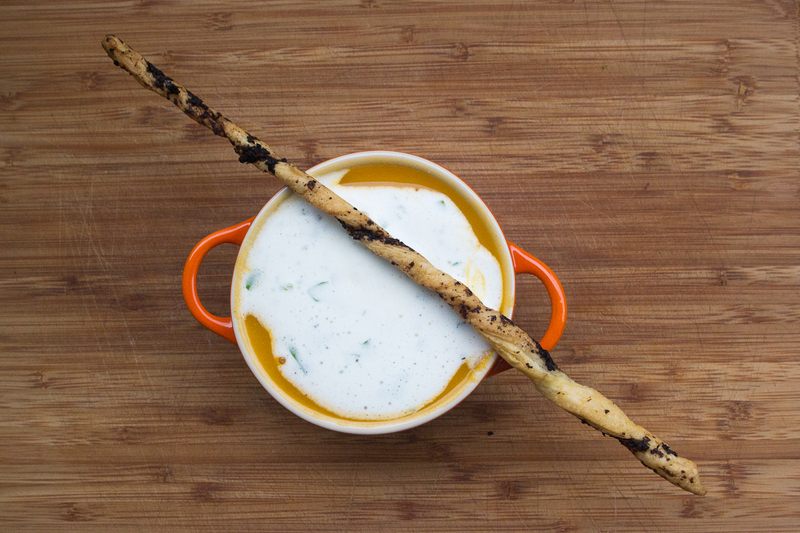 I served the soup with a homemade black olive grissini and covered it with a creamy layer with parsley. What do you need? for 5 liter soup: 3/4 of a big pumpkin, 4 tomatoes, 2 onions, 1 hot red pepper, 2 potatoes, rosemary, 2 liters of vegetable stock, pepper, salt, a pinch of cumin. For the grissini: a sheet of puff pastry, a clove garlic, 4tsp capers, 90ml olive oil, 100 gr black olives, pepper, salt. For the creamy layer: 200 ml of cream, handfull of parsley, pepper, salt. What do you do? Preheat the oven on 175°C. Chop the pumpkin in pieces. Take out all the seeds. Place the pumpkin on a baking sheet in a griddle or baking plate, cover with rosemary, olive oil, pepper and salt. Place the griddle in the oven for about 30-45 minutes until the pumpkin is soft. Take it out. Now you can peel it easily. While the pumpkin is in the oven you can cut all the vegetables (pepper, tomatoes, onions, potatoes). Take a big cooking pot. Add a bit of olive oil and fry the onions. Stir well. Add the vegetables with the pumpkin and keep on stirring. Pour the stock in the pot and bring to the boil. Let it boil for 15 minutes or till your vegetables are soft. Blend or mix the vegetables. Season with pepper, salt and cumin. For the grissini we first make the olive spread. Mix the black olives with pepper, salt, garlic and olive oil. Take the sheet of puff pastry. Spread with the olive tapenade. Cut out rectangles of 0,5cm x 15 cm. Twist the puff pastry rectangles until you have the helix of a corkscrew. Bake a preheated oven on 175°C for about 10 minutes. Whip the cream. Chop the parsley. Mix it with pepper and salt. Put in the fridge until you are ready to serve. The soup is almost totally made of vegetables of my grandfathers. 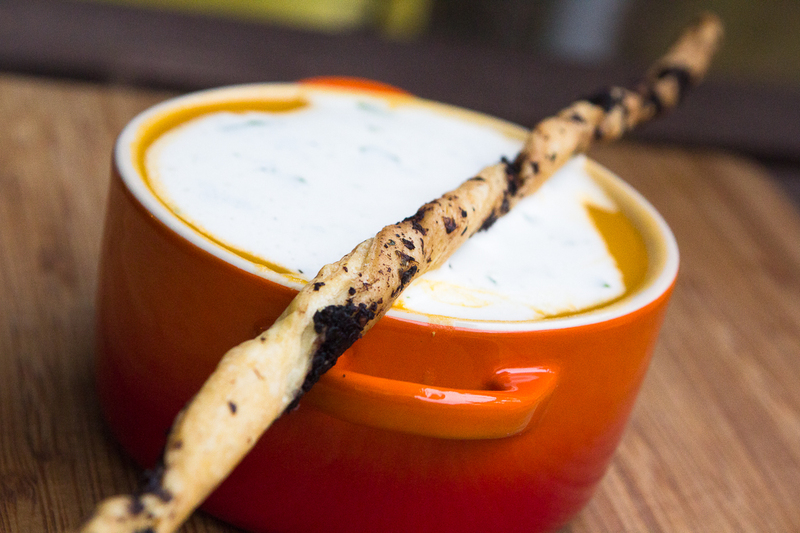 The recipe of the grissini is based on a recipe of Spermalie.